You don’t need a long list of tools! To get my business off the ground I bought one of the 4-piece, 18 volt cordless tool sets. When combined with the small box of tools I already owned, I was in business! It was that easy. Eye and ear protection, dust masks, knee pads and latex gloves. A small 5 drawer tool cabinet with all the common hand tools including a hammer, screw drivers, pliers, chisels, files, squares, wrenches, vise grips, tin snips, Allen wrenches and paint scrapers. The top drawer has compartments and a lid so it can carry all of the nails, screws, drywall inserts, wire nuts and most of the other miscellaneous small parts that I need. The second drawer holds all of my screwdrivers while the third drawer carries wrenches, pliers and drill bits. The next drawer has sandpaper, files, scrapers and spare blades. The deeper bottom drawer holds my hammer, squares, super bar, cat’s paw and a pouch with my continuity tester and stud finder. This small chest has proven to be the perfect tool box to keep me organized and it is not too heavy to lift in and out of the truck. A tool box with painting supplies. 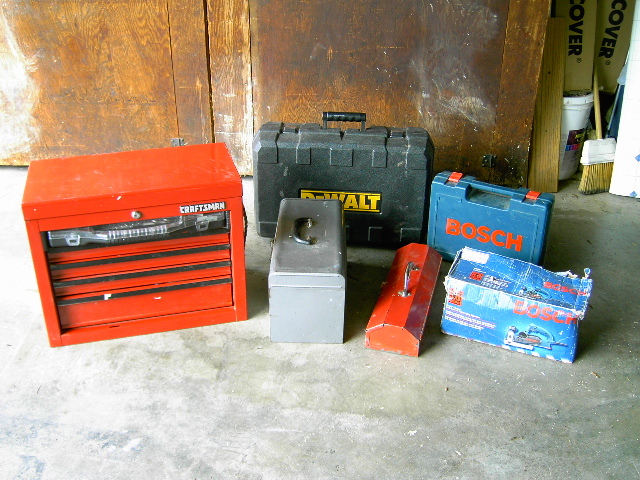 An additional tool box with tools for plumbing. Large covered plastic storage bin to carry all of the extra parts that tend to accumulate. Three 5 gallon buckets. One holds tubes of caulk and adhesives, another holds anything too long to fit in the tool box and the last bucket is for trash! I also carry a can of Latex Primer and a roll of paper towels at all times. Don’t let a lack of tools keep you from getting started as a handyman. Using the money you earn along the way, build your tool collection as the needs arise.